Puerto Rico is just days away from a historic economic collapse after the commonwealth’s governor said the island cannot pay its $72 billion in debts. Gov. 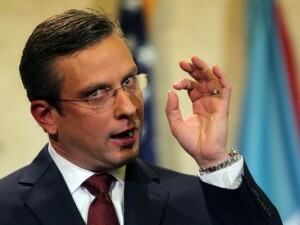 Alejandro García Padilla, who took office two years ago, told Puerto Ricans during a televised address Monday that his government’s attempts to slash expenditures and restructure its debt have failed. He said an analysis by former World Bank and International Monetary Fund officials showed the “harsh reality” of the economic situation. White House spokesman Josh Earnest said Monday that the Treasury Department has already been providing guidance to the island’s government and that an interagency task force would help identify existing federal funds that it could benefit from. But he said the administration was not considering any kind of bailout for the island of 3.5 million people. The inability of the U.S. territory to repay its debt, combined with the financial crisis in Greece, would have far-reaching implications for financial markets and unsuspecting American investors. Puerto Rico, which became a territory of the United States in 1898 after a war with Spain, cannot legally file for bankruptcy, as American cities like Detroit have done when faced with similar fiscal crises. The island’s constitution, however, states that Puerto Rico must make its debt payments before it pays for any other government services, leaving the island in a fiscal limbo if it cannot make its payments.